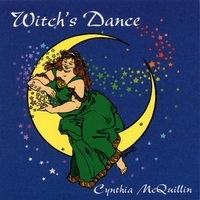 An enchanting collection of pagan and magical music by prolific singer/songwriter Cynthia McQuillin, ranging from haunting, mystical ballads to upbeat danceable songs. With Margaret Davis & Kristoph Klover of the bands Avalon Rising and Broceliande. All original pagan acoustic folk songs by award-winning Berkeley-based singer/songwriter Cynthia McQuillin. Featuring Cynthia's voice and 6-string acoustic guitar, plus back-ups as follows: Margaret Davis - voice, harp, flute, recorders; Kristoph Klover - guitars, octave mandolin, voice, bass, drums, oboe, synthesizer; Deirdre McCarthy - bodhran, doumbek, congas; Tim Gutierrez - steel drums; Caradwen von Braskat - lead and back-up vocals.